I hunted hard for 16 days straight never missing a hunt. No naps like them old timers lol. Just relentless hunting, scouting, hanging/moving stands and cameras! I passed on many many bucks. Lots of 2-1/2 yr olds. A couple 3-1/2's but they both were busted up from fighting. One would have been a 140 class had he not broken his G2 clean at the main beam. I was setup on a creek crossing the morning of the 16th that the bucks use to patrol in their search for willing does. On my walk in before daylight there was a deer not 25 yards from my treestand. It snort wheezed at me. Not wanting to blow it out in case it was a bruiser, I hooked a left and dropped off into the creek. I followed the deep creek out of his sight all the way to my tree. Once I was settled in, I snort wheezed. Immediatly I heard him hooking a tree in the area I went into the creek. Wasn't long and here he came. A 2-1/2 year old 8pt. He worked scrapes 15 yards from me. I let him go his merry way. Later a 6pt came and crossed the creek. The wind had switched right before 9am and I was about to bail out for fear of getting winded if one came in. Just as I was about to gather my stuff, I look up and see a nice buck coming. I powered up the video camera and grabbed my bow. He came in on a string right into the creek downwind. I baaaped and drew my Zona recurve and dropped the string. Not sure what happened but I hit him back a little. Maybe with all the clothes I had on I had string slap causing my shot to go left. Anyhow I watched him run out into the timber and stop. His tail was twirling like a helicopter blade which usually means he's hurting bad. I got down an hour and a half later and checked out my arrow. Dark red blood coated my arrow. I was pretty sure I got liver. I looked for blood a little ways in the direction he ran. Not seeing much I decided to back out. I came back around 2:30pm with a friend and we followed a sparse blood trail for 100 yars then nothing. We were right next to the creek. I told my friend this deer is dead and he is either in this creek or very close. We did a search and couldn't find him. I thought maybe he went onto the neighbors since the creek is the boundary. I knew he was hunting so I had to wait till he came in that evening. I called and asked permission to search on his property the next morning. He agreed but only after 9am since he would be hunting. The next morning at 9am I was there. I searched in his CRP field and found nothing. I circled back to the creek and found white hair. Lots of it. Then blood smears going down towards the creek. There he was, well what was left of him. I was very dissapointed because we had walked within 15 yards of where he was laying and never saw him the day before. Nice buck sir! Tough luck with the coyotes! 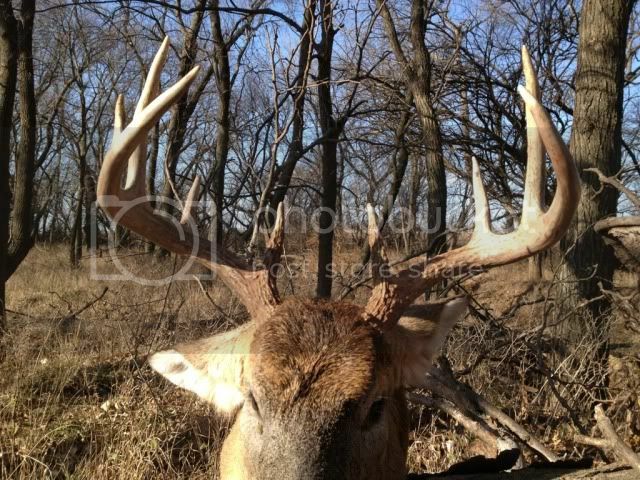 Incredible buck. Coyotes are quick in some places! 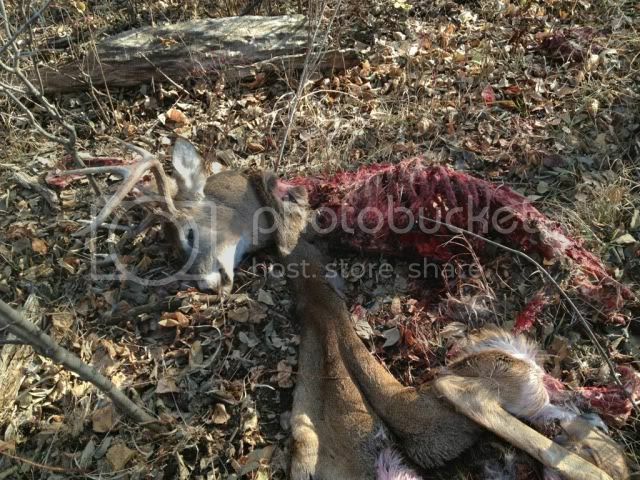 You must be thick with coyotes in that area....that deer was only down for about 24 hours and still completely torn up! At least you found him, too bad you were not able to enjoy some of the meat as well. Great buck! What part of the state were you in? Sorry the yotes got him Corey, but at least you got the horns! oh man i'm gonna have nightmares tonight!!! go read my post on powow. I shot a great buck tonight, similar story as yours. I hope i pick up the trail tomorrow and find hime still in once piece! at least you got part of him though! Great job Corey.Thanks for sharing with all of us.Congrats bro. Congrats! Glad you found him. nice buck! sorry to hear of your run in with the yottee's. We had the same thing happen to us in Wyoming!